Well, I stumbled across this idea all on my own. Today is cleaning day at my house and I was off to a good start. 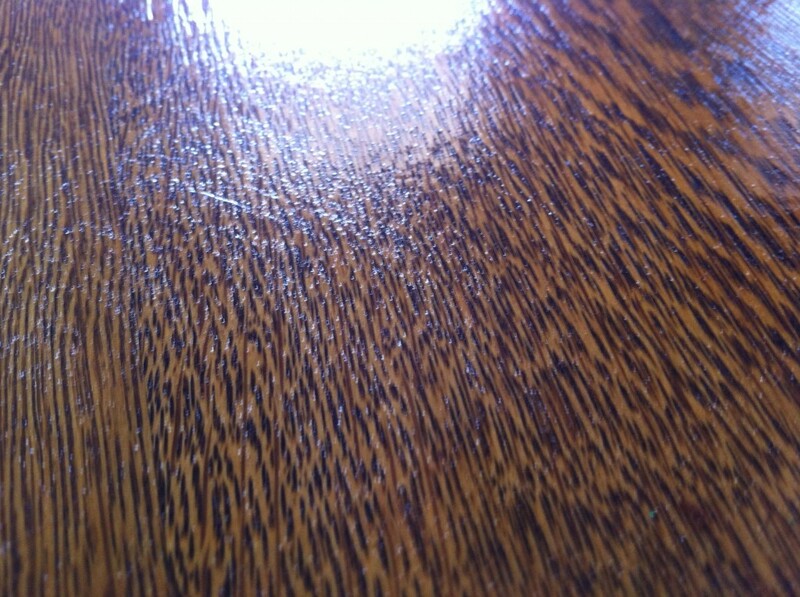 The problem was that I had green paint on my wooden kitchen table. I usually have this table covered with a table cloth, but it was in the wash and I was thinking that I could live without the table cloth if the table didn’t have the ugly green paint slathered all over it. The paint has been there for oh, over 6 months I would say. I’ve tried rubbing it off, scraping it off, etc. to no avail. I thought I might get some Magic Erasers at the store next time I was there. 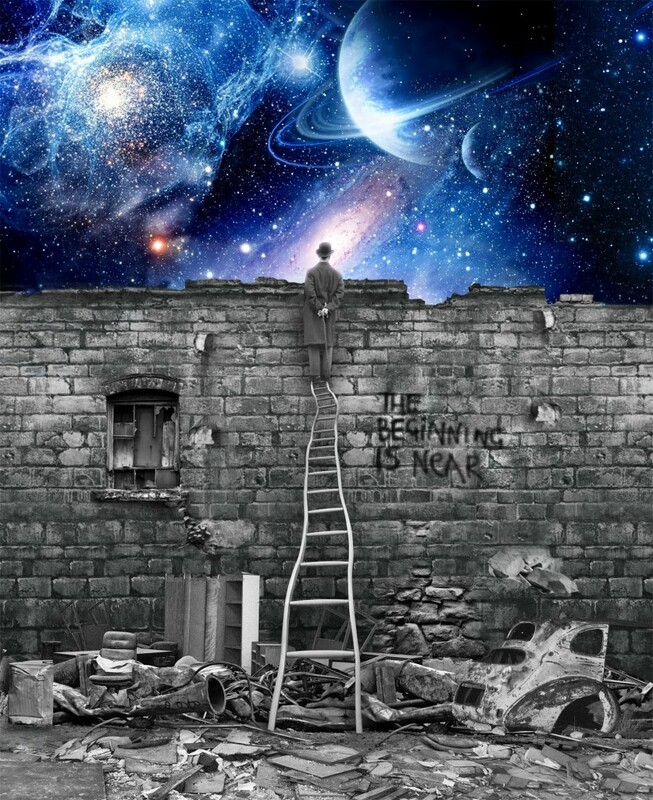 But being the impatient person that I am, I decided to go at it on my own yet again. It is cleaning day after all and I wanted that table clean NOW. I had pulled the vinegar out to clean the coffee pot. I had also pulled out my super sized Baking soda to scrub down the stovetop. As I stood staring at the paint stain, I thought. Hmm. 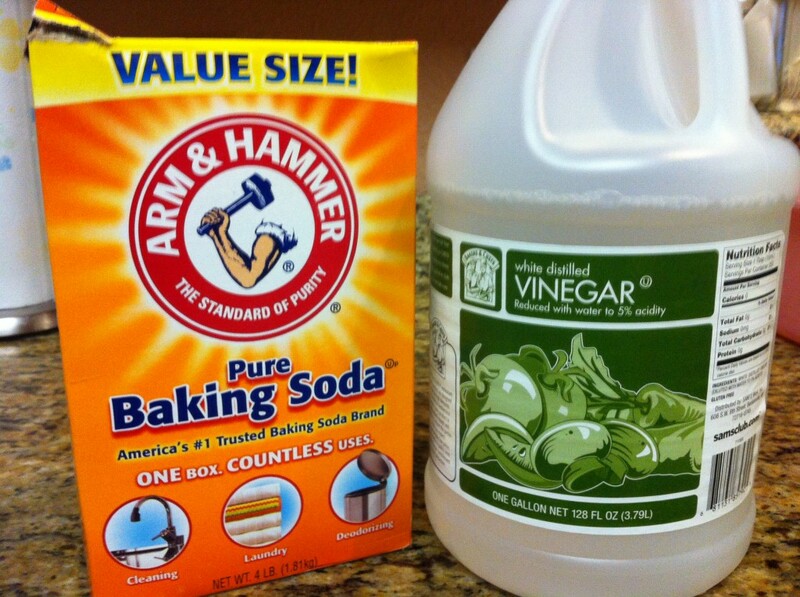 I wonder if I put the vinegar on a towel and then added a sprinkeling of baking soda if that would work. And guess what….That stain came out without any elbow grease from me at all! 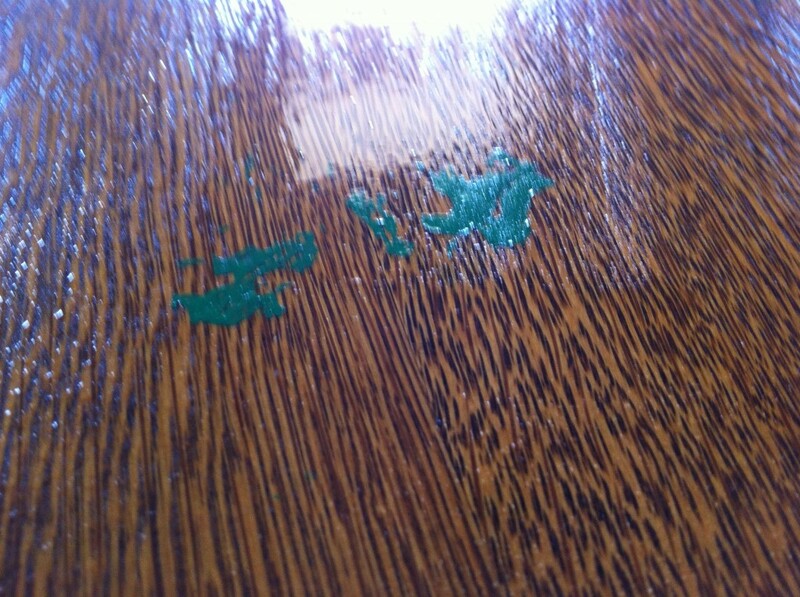 I just wiped it and the green paint transferred from the table to the cloth in seconds flat. (Be sure you use an old cloth if you try this at your house). So…no more Magic Erasers for me. With a cheap bottle of white vinegar and and even cheaper box of baking soda, I can attack any stain that wants to stand in the way of my clean house! Do you have any cleaning tips you found by chance? If so, leave me a message and let me know about it. The only thing that ever bothers me about living in the South is July and August. It gets incredibly hot here and since we live near the Gulf coast, it is of course, humid as all get out. But despite the hot summer what I LOVE about living here is that I can harvest veggies and fruit just about every day of the year. 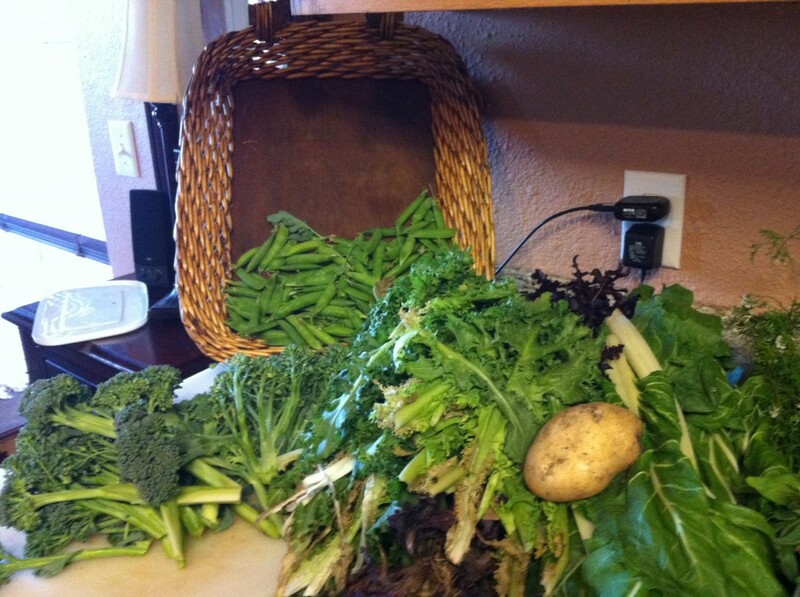 Today (and it’s only April) I brought in quiet a bundle: Broccoli, Peas, Swiss Chard, Spinach, one potato, Lettuce and Cilantro. One Potato? you ask. Well let me tell you why I have only one potato today. Now before I planted the potatoes back in February, I was following a technique using Bokashi Composting. Basically, Bokashi composting is an ancient way of using table scraps to vamp up your soil. While I was harvesting from my garden today, I noticed that there were three very different kind of plants with yellow flowers growing out of the side of the potato patch. I went over to investigate, thinking that a couple of very big weeds had taken root. I was ready to pluck them out of there until I realized what they were. So, what were the funny looking plants growing out of the side of my potato patch? Well, they were tomato plants. Apparently, there were some tomato seeds that took root there from my composting materials. They even had several tomatoes on the plants. Needless to say, I didn’t just pluck them up and throw them out. I dug them up by the roots. As I was digging them up I was coming across lots and lots of potatoes that were growing right alongside the tomato roots. One of the potatoes was torn from its mother plant so I brought it in with the rest of the harvest. That’s how I got just one potato. The rest aren’t ready yet. Not till round about May, I guess. But I’ve got one, and I was really kind of excited to get one this early. As for the tomato plants? Well, I transplanted them to my space reserved for tomatoes. They seem to be okay, only time will tell. But since I now have three extra tomato plants that means I am now growing 12 tomato plants instead of 9. Looks like I’ll be canning up lots of tomatoes this year. You just never know what your going to find going on in the garden. I swear I was out inspecting the potatoes just last week and didn’t suspect a thing. Now I have three gorgeous tomato plants that are much further along than my other tomatoes. Do you have any funny garden stories? If so, leave me a note and tell me about it. My son loves Minecraft…. No… He REALLY LOVES Minecraft. My son Caleb, Calebii01 on Minecraft, plays multiplayer with several people around the country and they talk while they play via Skype. Most of his online friends he met on Unschooling Gamers. On his 10th birthday, he was wishing we could invite all of his Skype Minecraft friends to his real birthday party. Well…we couldn’t do that, but we could invite them to an online party on Minecraft. So that’s what we did. With Cake, fireworks and even Creepers. We did it up right! On his birthday, we set a time and invited everyone that he knew that played Minecraft onto our Minecraft server. A couple of his friends from Portugal got to stay up late to participate. His older brother had prepared ahead of time for the occasion. Following is the result of that party. Be sure and read the chats. Minecraft User Names: I’m momcraft01. His Dad is Stacy_C. His brother is Camii01. My husband edited this down to a 4 minute video but the actual party lasted about an hour. Caleb had such a great time and all of the kids that joined us said it was the best birthday party every. Hope you enjoy. Have you had an inspirational idea for your kids birthday party? If you have, please tell me about it. Caleb’s Minecraft Party from Stacy Conaway on Vimeo. In a large stock pot, mix the soaked beans and the remainder of the ingredients except Salt. Bring to a boil. Simmer for at least 2 to 3 hours or until beans are tender. Add Salt to taste. Serve with brown rice and jalepeno cornbread. Sort beans and remove and debris. Add beans to stockpot and cover with water. Bring stockpot to a boil. Boil for 1 minute. Remove from heat and cover. Let stand in water for one hour. Proceed with cooking. You are currently viewing the archives for April, 2013 at Michelle Conaway.